CINCINNATI (AP) — Rookie Sam Hubbard was disappointed as Ryan Tannehill slipped past him, avoiding a sack. A moment later, the football slipped out of the quarterback’s grasp and flew right to Hubbard, who was as surprised as anyone to have it in his hands. “All I had to do was run straight,” Hubbard said. Straight into the end zone he went on a 19-yard fumble return , yet another wacky play that completed Cincinnati’s indescribable comeback. The Bengals scored 27 straight points and rallied for a 27-17 victory over the Miami Dolphins on Sunday that extended their best start since 2015 — the last time they made the postseason. This one is looking a little more like a playoff team each week. “The vibe over here is crazy,” running back Joe Mixon said. The Bengals (4-1) appeared headed for a desultory home-field loss as the Dolphins (3-2) — playing with depleted lines — rolled ahead 17-0 with the help of Jakeem Grant’s 70-yard punt return for a touchdown. The Bengals’ defensive line pulled it out with two wacky plays. Tannehill tried to avoid a sack by throwing the ball at his tight end’s feet. Instead, it slipped from his hand and caromed off Durham Smythe’s helmet, flying directly to Michael Johnson. He ran 22 yards untouched for his first NFL touchdown. The defense closed it out when Carlos Dunlap hit a scrambling Tannehill and the ball flew directly to Hubbard for his quick jaunt to the end zone and a 27-17 lead with 2:37 to go. The win left Cincinnati alone atop the AFC North heading into a rivalry game next Sunday at Paul Brown Stadium against the Pittsburgh Steelers, who have won six straight and 14 of 17 in their series. The Dolphins have to recover from a 38-7 drubbing by New England and their meltdown against the Bengals, with Bears up next. Cincinnati’s young defense has given up a lot of yards but made decisive fourth-quarter plays in three of their wins. Safety Clayton Fejedelem returned a fumble for a touchdown to beat Indianapolis, and the Bengals forced a fumble by Joe Flacco that set up their win over the Ravens. On Sunday, they had the two decisive touchdowns. “Look at the plays these guys made down the stretch today, and they’re rookies,” coach Marvin Lewis said. The Bengals got a break with Mixon, who missed only two games after having a piece of torn cartilage removed from his right knee. With their other veteran running back — Giovani Bernard — sidelined with a knee injury, they leaned heavily on Mixon and he came through. 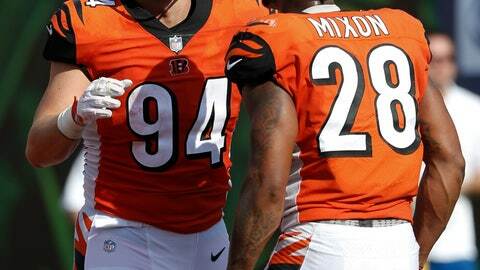 Mixon ran 22 times for 93 yards and had three catches, including an 18-yard touchdown. The Bengals hadn’t been shut out in an opening half and rallied to win since 2004, when they trailed Miami 3-0 at halftime and pulled it out 16-13. It was only the fourth time in franchise history that they scored 24 points in the fourth quarter and won — they also did it in 1972, 1978 and 2004. Grant’s 70-yard punt return made him the first Dolphin to score on a reception, a kickoff return and a punt return in the same season. He had a 102-yard kickoff return against Tennessee in the season opener. Grant joins Dante Hall (2003) as the only NFL players with a 100-yard kickoff return, a 70-yard punt return and a 50-yard TD catch in the same season. The last NFL player with a touchdown of all three varieties was the Chiefs’ Tyreek Hill in 2016. Miami already was missing two starters on the offensive line when left tackle Laremy Tunsil got a concussion early in the fourth quarter. The Dolphins struggled to protect Tannehill the rest of the way, contributing to the Bengals’ surge.